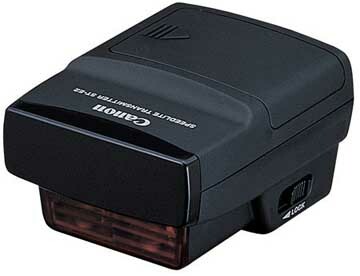 The Canon ST-E2 Speedlite Transmitter is a basic optical transmitter that will fire compatible flashes off-camera up to 49' feet away (32' outdoors). There must be good line-of-sight between the transmitter and your flashes to operate. To use, slide the transmitter onto the hot shoe of your Canon DSLR and turn the transmitter on. When transmission is possible, the "Pilot" light will turn on. Your off-camera flash (flash rentable separately) must be on and the AF-assist beam emitter will blink when ready to receive signal from the transmitter. The ST-E2 is the "master" and your flash(es) must be set to "slave". This transmitter will control up to 2 groups (A and B) and 4 channels (1-4). The channel on your flash must match what is on the transmitter. Please see this guide for more details. Please also see the Notes tab for more info on compatible flashes. This transmitter is great for basic line-of-sight optical off-camera triggering for portraits, still live photography, and small events. • 2 CR5 lithium (6V) batteries are required to operate this transmitter and they are not included. • This transmitter is an optical transmitter only. It will not fire flashes via radio which means there must be line-of-sight for the infrared pulse. • Compatible with any Canon DSLR or Canon PowerShot with a hot shoe.